We’d love your help. Let us know what’s wrong with this preview of The Reluctant Midwife by Patricia Harman. To ask other readers questions about The Reluctant Midwife, please sign up. Harman successfully sketches the harshness of the 1930’s. The Great Depression at the center as well as a tragic wildfire. Despite the desperation, the lack of food and work, in some instances homelessness, people pull together and hold out a helping hand and/or open their doors. Neighbor looking after and supporting their fellow neighbor. Inspiring and uplifting of the sense of community in the face of difficult trials as struggles were shared together. Becky isn’t easy to like, in fact she’s do Harman successfully sketches the harshness of the 1930’s. The Great Depression at the center as well as a tragic wildfire. Despite the desperation, the lack of food and work, in some instances homelessness, people pull together and hold out a helping hand and/or open their doors. Neighbor looking after and supporting their fellow neighbor. Inspiring and uplifting of the sense of community in the face of difficult trials as struggles were shared together. Becky isn’t easy to like, in fact she’s downright cold and aloof. I was’t sure if she would grow, as the story continues, the reader is given glimpses of hope. A skilled nurse but her bedside manner clearly lacking – her frustration with Blum infuriated me at times. She possesses a kind heart, however, you find yourself straining to see the goodness. Yes Becky has had her share of heartache but my goodness she is so pessimistic. She’s on the edge of giving up hope, after a while it becomes increasingly frustrating. Patience is Becky’s polar opposite, amazing given her incredibly painful past, yet she is optimistic, warm, approachable and unlike Becky she enjoys midwifery. Two differing women with their perspectives under a lens. The Reluctant Midwife is a heartwarming and engaging novel by Patricia Harman, set in the same location and era as her fiction debut, The Midwife of Hope River. Penniless, homeless and the sole carer of her inexplicably catatonic ex-employer, Dr Isaac Blum, nurse Becky Myers is in desperate straits by the time she arrives in Hope River, rural West Virgina. It is the 1930's, times are tough for everyone, and with few options, Becky is forced to figure out a way to support herself and Blum. Harman effortlessly evokes the era in which The Reluctant Midwife is set. The focus is on the challenges of the Great Depression, in rural areas unemployment rose to around 80% leaving hundreds of thousands of people struggling to survive. With a little luck and hard work, Becky finds a way to eke out a living as the Depression ravages the country. Though initially forced to rely on the generosity of friends and neighbours, she delivers groceries, reluctantly assists the local midwife Patience Murphy, and becomes a part time staff nurse at a nearby Civilian Conservation Corps camp. Characterisation is a real strength of Harman's writing. Becky is not a saint, she can be uptight and prideful, she is often frustrated by Blum's non responsiveness and resents having to work as a midwife when the whole notion of childbirth horrifies her, however it is difficult to fault her drive to better her circumstances. I really enjoyed the way her hard edges softened over the course of the novel. Readers familiar with The Midwife of Hope River may remember Dr Blum as an arrogant and cold man. His unexplained catonia was precipitated by the death of his wife, and he is now a pitiful man but his silence also hides a secret. I loved reconnecting with Patience Murphy, Hope River's sole midwife, now married to the 'new' vet, Daniel Hester and the mother of a young son, but even more minor characters, like Nico and Captain Wolfe are well drawn and believable. I’m always very, very hesitant when a book’s description boasts that fans of Whatever Book or This Show will love it—kind of like when a book’s description says a mixture of This Popular Book and That Popular Book. What can I say? I’m a skeptic. I’m a huge Call the Midwife fan. (Hint: it’s on Netflix, folks!). So when I read the description for The Reluctant Midwife, I laughed. Just because it says ‘midwife’ in the title doesn’t mean it’s going to satisfy my need while I wait for the next season I’m always very, very hesitant when a book’s description boasts that fans of Whatever Book or This Show will love it—kind of like when a book’s description says a mixture of This Popular Book and That Popular Book. What can I say? I’m a skeptic. I’m a huge Call the Midwife fan. (Hint: it’s on Netflix, folks!). So when I read the description for The Reluctant Midwife, I laughed. Just because it says ‘midwife’ in the title doesn’t mean it’s going to satisfy my need while I wait for the next season to show up on Netflix, I thought. Well, kudos to whomever included that in the description, because it definitely hit the spot. Disclaimer: I did not read the first book in the Hope River series. I wanted to see how this particular book fared by itself. I’m pleased to say that if you would rather just read this one, you don’t need to read the first to understand what is going on. That being said, I can definitely see how reading the first one would help the reader understand various characters’ backgrounds. I plan on going back and reading the first. Speaking of characters, I loved them. Betsy is an incredibly real protagonist, who has very real, raw emotions while dealing with Dr. Blum (who, in the wake of his wife’s death, has become catatonic), her new impoverished situation, and figuring out who she wants to be. She experiences plenty of anger, gratitude, happiness, and frustration to make her a very relatable character. Patience, the midwife, is incredibly sweet and loving, and she’s the primary reason I’ll be reading the first book (she’s the star of that one). Her husband is cool, her son is adorable…I loved them. Even minor characters, like the grocer or the woman on the outskirts of town who Becky delivers groceries to, are important and multi-dimensional. I found the labor scenes simultaneously horrifying and page-turning. Whether the baby was blue, the mother was shrieking, or the midwives had to do something to keep mother or baby alive, I was transfixed. Naturally, I picture Becky as Jenny Lee aka Jessica Raine (but with an American accent, of course). The imagery is vivid—you can almost hear the grunts, moans, and pain of the women involved. I did have one gripe: it was very long, with quite a few dull parts in between. Those bits are slow and hard to read. I suppose that’s how life is, though. It’s not always exciting. The book definitely read more like a diary than a novel. Rather than the entries being split up by date, they were broken into small subheads. Overall, I loved this book and would definitely recommend it to those who are interested in historical fiction based in the 20’s and/or midwifery. I rated it a 4/5 on Goodreads. Babies, folks helping each other, and a difficult, but wonderful era. Patience and Becky knew each other from years before and became reacquainted when Becky moved back to town with Dr. Blum who is now disabled. THE RELUCTANT MIDWIFE is one of those books you won't want to put down because the characters are so wholesome and because the story is so homey and heartwarming. Patience and Becky are characters you would want for a friend. ENJOY if you read THE RELUCTANT MIDWIFE....any women's fiction fan will be hooked. You will want to crawl into the pages of the book, to be one of the characters, and to share in their lives. What fabulous sequel to the "The Midwife of Hope River". Nurse Becky Meyers, and the doctor she served, Dr. Isaac Blum, return to Hope River to settle into Dr. Blum's family home, only to discover it's been sold to settle back taxes. Dr. Blum has become catatonic, and Becky hopes the peace of the countryside will restore his spirits. But with no place to call home, Becky seeks out Patience Hester. But the Hester homestead has been abandoned. Fortunately, Patience and her husband David have only What fabulous sequel to the "The Midwife of Hope River". Nurse Becky Meyers, and the doctor she served, Dr. Isaac Blum, return to Hope River to settle into Dr. Blum's family home, only to discover it's been sold to settle back taxes. Dr. Blum has become catatonic, and Becky hopes the peace of the countryside will restore his spirits. But with no place to call home, Becky seeks out Patience Hester. But the Hester homestead has been abandoned. Fortunately, Patience and her husband David have only moved to the other side of the mountain. David accepts Dr. Blum as a helper for his veterinary practice, and slowly Dr. Blum shows glimpses of healing. A great friendship develops between the two couples. Desperate for work Becky takes the position of camp nurse at the CCC camp. There she cares for the men, coming to admire many for the dedication to their service and the heroic actions taken in the midst of great danger. The depiction of the hardships of the 1930s are vivid. The descriptions of the beauty of the mountains, and the people who inhabit them make you feel a part of the community. At times gritty, and not always happy-ever-after, the novel is a tribute to perseverance and the true meaning of community and being a good neighbor. This is a book that once you turn the first page, you will not be able to put down. We are transported the 1930’s in American, and back to West Virginia, the Great Depression. West Virginia is at 80% unemployment, and nurse Becky Meyers finds herself homeless and also the caretaker of her former boss Dr. Isaac Blum. I felt myself walking in Becky’s shoes, looking at the bread lines, and having feelings of doubt as a baby is about to come into the world. I was holding to tooth brush as we brushed This is a book that once you turn the first page, you will not be able to put down. We are transported the 1930’s in American, and back to West Virginia, the Great Depression. West Virginia is at 80% unemployment, and nurse Becky Meyers finds herself homeless and also the caretaker of her former boss Dr. Isaac Blum. I felt myself walking in Becky’s shoes, looking at the bread lines, and having feelings of doubt as a baby is about to come into the world. I was holding to tooth brush as we brushed Dr. Blum’s teeth. I had a lot of admiration for this woman, and what a hard lot in life she had been given, but she rolled with the punches, and came out a winner. We also walk in Dr. Blum’s shoes, and sometimes, we wish we didn’t, such pain he kept locked up in his silence. What a blessing Hestor is to him, and even if he is stoic he seems to respond silently to help. I feel blessed to have never lived during the Great Depression, but the author has painted a picture of that time that will linger a long time with you. This is a book not to be missed! I received this book through Edelweiss and William Morrow Paperbacks, and was not required to give a positive review. The Reluctant Midwife picks up about 5-ish years after The Midwife of Hope River, still in Union County, West Virginia. The story focuses on Nurse Becky Myers and her ex-boss, Dr. Isaac Blum. This book reads just fine as a standalone, but in my opinion it is much better if you've read the first book because the main characters from that story play major roles in this one and it is nice to have their backstory. Both Becky and Isaac were secondary characters in the first book. Becky Myers was prev The Reluctant Midwife picks up about 5-ish years after The Midwife of Hope River, still in Union County, West Virginia. The story focuses on Nurse Becky Myers and her ex-boss, Dr. Isaac Blum. This book reads just fine as a standalone, but in my opinion it is much better if you've read the first book because the main characters from that story play major roles in this one and it is nice to have their backstory. Both Becky and Isaac were secondary characters in the first book. Becky Myers was previously a home health/public health nurse, but she left West Virginia to work with Dr. Isaac Blum when he moved his private practice up north. As The Reluctant Midwife begins, Dr. Blum has suffered a tragic event that has left him disabled; in the absence of anyone else to care for him, Becky has become Isaac's primary caregiver. Without an income from Dr. Blum's medical practice, they have lost everything. So they have moved back to West Virginia in hopes of starting over and finding some type of work or help or...something. Becky is just looking for something. When the story begins, Becky is a little bit frustrated and tired from all of her caregiving responsibilities and from the lack of resources they have. Becky is used to having a paycheck and a place to live, so being essentially homeless and broke is new for her. When she gets back to West Virginia, she has to rely on the goodness of neighbors to help her out, which is tough for her. So I think all of this makes it hard to get close to her in the first part of the book...or at least, she is a little tougher to love than Patience Murphy was (in the first book). Becky is able to find a little bit of work helping Patience out with midwifery duties since Patience is pregnant with lots of responsibilities, but Becky has always been uncomfortable with childbirth. (the "reluctant" midwife - get it?) Patience is a patient (*wink, wink*) teacher, though, and she has Becky doing a great job delivering babies on her own before too long. But this book is less about birthing and midwifery than the first one. Becky actually does all types of nursing duties. In addition to helping Patience out with local midwifery, Becky is actually able to secure a position with the local CCC (Civil Conservation Corps) as their Camp Nurse. While she is sometimes paid for her work delivering babies, she earns a steady income working for the CCC. This is a huge relief for Becky as she is primary breadwinner in the household with Dr. Blum unable to work. 1. Dr. Blum, while not my favorite character in the beginning of the book, makes this incredible transformation as a character throughout the story. I'm not only talking about his physical transformation, but I'm talking about his entire character development. By the end of the story, I love him as much as I love Daniel Hester, the vet, from the first book. So, so good. 2. Speaking of Daniel the vet: he and Patience the midwife have an enormous role in this story. This isn't one of those series where the previous main characters just happen to show up in one scene in the following books. Patience and Daniel are HUGE in this story. So if you have read the first book and love them, you'll be OVER THE MOON with the continuation of their story in this installment. If you haven't read the first book, what are you waiting for? They are absolutely delightful. Truly. I adore them both. 3. While I have a special interest in birthing and midwifery, it really does not take up as much of this book as you would think given the title. So I think this book has a much broader appeal to people that aren't as interested in, you know, birthing scenes. There are still some in here, but I think the overall nursing and medical portions of this book are largely situated on taking care of people with limited resources and/or away from a medical facility. Becky is "reluctant" because midwifery isn't her first choice of work in the nursing field. 4. I still love the Depression-era West Virginia setting. Very well done. 5. The journal entries. If you read it, then you know. This story is a great visual on just how difficult a time this particular part of the country had recuperating after the Stork Market crashed, during the height of the Great Depression. During the time that the Dust Bowl was occurring elsewhere. During FDR's New Deal (1933-1936). These characters are wonderful and they are perfect examples of what community looks like when it leans on one another and takes care of one another. I cannot say enough GOOD THINGS about this series. I love love love rereading these books. Total enjoyment. Audiobook Notes: The Reluctant Midwife audiobook had a different narrator than The Midwife of Hope River-I'm assuming they went with someone else because the character's point-of-view switched from one book to the next. Heather Henderson narrated this book and did a nice job as Becky. This is another one that I'm glad that I purchased thru Audible and will listen to again in the future. Another excellent book by Patricia Harman! Returning to Union County with Dr. Blum in tow, Becky Meyers the one time Health Nurse of Liberty, WV. Dr. Blum has become catatonic after a tragedy in his life, they come to live in his house after not receiving any help from his family. After finding the house is sold, Becky stays at Patience Murphy's old house and tries to get a job. Set during the depression, 1934, it is very hard to do so. With the help of her old friend Patience, Becky becomes the Another excellent book by Patricia Harman! Returning to Union County with Dr. Blum in tow, Becky Meyers the one time Health Nurse of Liberty, WV. Dr. Blum has become catatonic after a tragedy in his life, they come to live in his house after not receiving any help from his family. After finding the house is sold, Becky stays at Patience Murphy's old house and tries to get a job. Set during the depression, 1934, it is very hard to do so. With the help of her old friend Patience, Becky becomes the reluctant Midwife of Hope River. 4.5 stars. I so enjoyed the characters and setting of this book! Nurse Becky is caring for her former employer, Isaac Blum who has been silent since the death of his wife. They find themselves homeless & jobless, so they return to Hope River. There Becky finds a home, and her friend Patience. It is a story of overcoming barriers, friendship, and finding hope. I loved it, and can't wait for her next novel. I also read The Midwife of Hope River, and recommend both for a good read! This was historical fiction. I like this genre and I willingly search out books that fall into this category. I was excited when I got this one and I thought I'd enjoy this one more than I did. However, overall, this one was just okay for me. The story line was predictable early on and it was a little on the "overly sweet" side for me. So 2 stars. Becky Myers is used to hard work and a life filled with disappointment. She grew up with privilege as the daughter of a local physician in Vermont. She married a doctor before the Great War and continued to live in New England. Sadly, her husband was never quite the same after his return from the war and committed suicide shortly after his return home. Determined to start over, Becky received additional medical training and eventually settled in West Virginia as a nurse with the public health de Becky Myers is used to hard work and a life filled with disappointment. She grew up with privilege as the daughter of a local physician in Vermont. She married a doctor before the Great War and continued to live in New England. Sadly, her husband was never quite the same after his return from the war and committed suicide shortly after his return home. Determined to start over, Becky received additional medical training and eventually settled in West Virginia as a nurse with the public health department. She then left West Virginia and moved to Virginia to become the nurse in the practice of a local physician. When that physician becomes catatonic and she has nowhere else to go, she and Dr. Blum return to Hope River, West Virginia. Becky thought that Virginia had been hit hard by the depression, but West Virginia and its residents are struggling. For the first time in her life, Becky is dependent upon the kindness of strangers to ensure she and Dr. Blum won't starve. The one thing that Hope River needs is another midwife, since Becky's friend Patience is unable to meet the demands of the county. Unfortunately midwifery is the last thing that Becky feels comfortable providing, but she soon realizes that she either provides this service or starves. First, let me say if you haven't read The Midwife of Hope River then you need to read it as soon as possible. Is it possible to understand the action in The Reluctant Midwife without reading The Midwife of Hope River first? Yes it is, but simply trust me on this one and read The Midwife of Hope River first. Now that I have that out of the way, the second, and by far the most important thing is that I loved both of these books. I don't mean these books are nice, even though they are, or just that they are well written, and again they are . . . I mean that Ms. Harman has the ability to craft stories with characters that are so vivid and colorful that you'll want to know more about them. The action in both books is portrayed realistically and without any sugarcoating. Life in the early 1930s was hard for a large number of people across the United States. Unemployment was high and social services were all but unheard of in many areas. Even with the harsh, hardscrabble life for most of the people portrayed in both books, there is always an underlying sense of tenacity and hope. Becky gets to witness this first hand and quickly comes to realize that even though she and her former boss, Dr. Blum, may be experiencing difficulties, they are also blessed. Ms. Harman reintroduces the reader to many characters from The Midwife of Hope River, namely the midwife Patience, her husband the veterinarian Daniel Hester, their son Danny, the pharmacist and his wife, the grocer and his wife, the colored pastor and his wife, and more. The reader is also introduced to new characters like Captain Wolfe from the Civilian Conservation Corps (CCC) camp, a few mafia men from Pennsylvania, the young worker-turned-medic from the CCC camp, and more. First Lady Eleanor Roosevelt even makes a cameo appearance. There is suffering and death interspersed with joyous tales of survival and life. It was fascinating to read about Becky's transformation from this somewhat formal and privileged woman to one that becomes more relaxed, slightly more informal, and willing to do anything necessary to survive. Becky's change begins when she becomes the caretaker of her former boss, Dr. Blum. Her change continues as she becomes more relaxed and self-assured with her midwifery skills, and is completed when she eventually becomes the nurse and sole medical personnel at the CCC camp. Obviously I can't tell you everything about the book because then you won't need to read it. There are stories within stories in both The Midwife of Hope River and The Reluctant Midwife. Ms. Harman provides the reader with insight into the primary characters, Patience and Becky, by giving glimpses into their pasts as well as their present lives. Did I enjoy reading these books? Yes! I read both cover-to-cover with minimal interruptions or breaks. If you enjoy reading historical fiction, you'll definitely want to read these books. If you think you don't like historical fiction, trust me and read these books. I can only hope that there will be more stories from Hope River in the future. This is the second novel in the Hope River series following The Midwife of Hope River and I had not read the first one. I carefully researched before requesting this to ensure that I could read it as a stand alone and I was correct. That being said for those who have read the first story the character of Patience is still a key character in this story so those who want more of her will get it with this book. As is my tendency I am going to try to not discuss the plot but more of my thoughts on how the book made me feel. The highlight for me was the backdrop of when the story took place. Deep in the middle of the great depression I was fascinated with how people were struggling and surviving on little to no resources. The story spoke of the government programs in place to try to help with the unemployment rate and how communities attempted to help their own and how people would do almost anything to be able to put food on their table. This appealed to me even more than Becky's story. I also had a strange fascination with Blum. The question ever lingering as to if he will ever snap out of his inner prison. What were his feelings for Becky? He was probably my favorite character which is kind of funny as he had very few words to say. The dynamic between Blum and Becky was an interesting one. It is almost like in hos wordlessness that he was carefree temperament to Becky's uptight personality. Now this story is title The Reluctant Midwife so you know there will be some birthing scenes. As someone who has only every has fur babies I did find them a little disturbing. I don't know why but everything about child birth has always made me feel a little light headed so I did struggle with the passages that described it. Others may not. Also if I had to add a little critique I would say that a lot of the scenes were descriptively the same. I got a little sick of reading "mmmmmmmmmm" every time a mother had a contraction. There are other words/description to describe the pain. After reading The Midwife of Hope River, I was eager to revisit the simple, honest folks of Liberty, WV. Like my everlasting love for Montgomery's Anne of Green Gables, my appreciation for Patricia Harman's work stems from her desire to portray a place and time honestly -- with optimism rather than pessimism. Folks are not perfect (some are not even decent) and terrible things sometimes happen, but hope prevails. 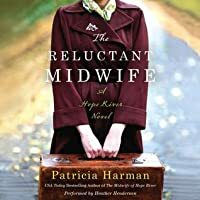 "The Reluctant Midwife" by Patricia Harman, is a sequel to "The Midwife of Hope River" (which I have not yet read, but that did not affect my reading of this book). Becky Myers is now taking care of Isaac Blum, the physician whom she assisted in both surgery and outpatient practice. Dr. Blum has suffered a catatonic seizure after the tragic accidental death of his wife. His brother lost patience with Isaac's mute state and cut him off completely, so, with no one else to care for him, Becky takes "The Reluctant Midwife" by Patricia Harman, is a sequel to "The Midwife of Hope River" (which I have not yet read, but that did not affect my reading of this book). Becky Myers is now taking care of Isaac Blum, the physician whom she assisted in both surgery and outpatient practice. Dr. Blum has suffered a catatonic seizure after the tragic accidental death of his wife. His brother lost patience with Isaac's mute state and cut him off completely, so, with no one else to care for him, Becky takes on his care. However, due to Dr. Blum's loss of his practice and home, they are in deep financial arrears. Throughout the book, Becky is faced with the challenge of providing a living for them both while making sure that Isaac Blum is not left to wander off on his own. "I wake just as the sun is peeking over the mountains, thinking about President Roosevelt's fireside chat last night. The Hesters had us over to dinner and just like old times we sat around the radio listening, along with all the other worried Americans. In his quiet, reassuring way, Roosevelt talked about the Public Works Project, about getting people off the dole, about a new program called Social Security. Most important, he gives us hope that these dark days will not last forever." Isaac Blum comes out of his catatonic state long enough to suggest (in a one-word sentence), that they turn to Patience Murphy for help. Maybe Patience will allow us to stay with her for a few days. I'd be grateful even to sleep in her barn." Patience (now married to a veterinarian, Daniel Hester), helps Becky and Isaac find a place to live and, although she would rather set a broken bone or suture a wound, Becky finds herself assisting Patience in deliveries. When Patience herself has a medical emergency, Dr. Blum and Becky move into the Hester's home to help care for her and their five year old son. The book has some medical details that might be difficult to read (depending upon the reader's stomach tolerance), but for me, I didn't they them overly graphic. Knowing that this book is about childbirth, there are difficulties that arise that are quite simply, realistically portrayed. There are many stories of delivering babies with various challenges of the times and limits of the medical field, and later on, administering first aid in an all-men's Civilian Conservation camp. Interspersed with the medical scenes are vignettes of what is happening in Becky's own life and the lives of her neighbors and friends, Patience and Daniel Hester. How Becky manages to hold down a difficult job, help Patience through her medical challenges, and keep Dr. Blum going makes for an interesting read! One thing that kept me going was wanting to know if Dr. Blum would ever recover. I was quickly caught up in the lives of the characters and reading about the challenges of the Depression years. I enjoyed reading "The Reluctant Midwife"! "Dark night and the wind slams into our little house from the west. I've been awake in bed for hours, my mind skittering from one worry to another. It's not like we're starving. We get tomatoes, carrots, new potatoes, and greens from the garden. Daniel brings us eggs and milk twice a week in exchange for Isaac's help with the vet work, and the fish have been a great addition to our diet, but we have so little cash money for kerosene, gasoline, sugar, corn meal, and beans. I am really worried about what we will do this winter." When I agreed to review this book, I realized that I should probably read the first book, The Midwife of Hope River, first. I'm normally one of those readers who just can't jump into a series mid-stream and starting with The Reluctant Midwife just didn't sit well with me. So, before I go any further with this review, I do feel I should address the "sequel" aspect of this book. Yes, The Reluctant Midwife is the second book in the series and, in many ways, it feels like a second book. However, the When I agreed to review this book, I realized that I should probably read the first book, The Midwife of Hope River, first. I'm normally one of those readers who just can't jump into a series mid-stream and starting with The Reluctant Midwife just didn't sit well with me. So, before I go any further with this review, I do feel I should address the "sequel" aspect of this book. Yes, The Reluctant Midwife is the second book in the series and, in many ways, it feels like a second book. However, the two books are very different. The first installment addresses several issues of the time and delves deeply into midwifery. This book, however, addresses far fewer issues--it mostly focuses on the Great Depression--and deals more with general nursing than with midwifery. Speaking for myself, I'm glad I read The Midwife of Hope River first. However, I don't think that is absolutely necessary. 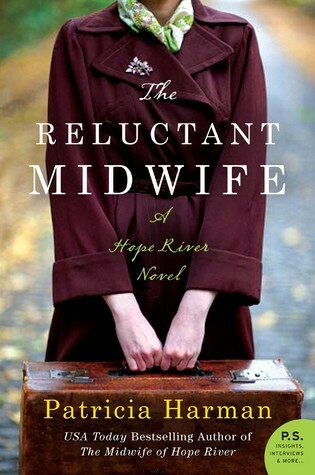 If someone were to read only The Reluctant Midwife, they would recognize that there was a previous book that fleshed out some of the supporting characters, but not reading The Midwife of Hope River would not affect the actual story of The Reluctant Midwife. While I wouldn't go so far as to call this book a standalone, I would say that its plot does not depend on the preceding book. This was a comfortable read for me. Harman again does an admirable job of recreating Depression-era Appalachia. I think it is probably easy for modern readers to think of the Great Depression as something a little bit worse than the recent recession, but Harman makes it perfectly clear how hard that part of our history truly was. At the same time, because she doesn't focus on too many aspects of the Depression, this is one of the historical fiction novels that readers who don't normally read historical fiction might like. In this installment of the Hope River series (I'm not sure if Harman is planning any other novels, but we'll just call it a series for right now), Harman has created a tight story--the plot is centered entirely on Becky Myers, a once professionally and financially comfortable nurse who now finds herself penniless and in charge of her former employer, who has suffered some sort of mental break and is in an almost unresponsive state. I didn't always like Becky, but I always admired her. Yes, she had her periods of self-pity and what some may consider ugliness, but who wouldn't in her position? I found the plot to move at a nice clip, which should appeal to many readers. I will admit that I found the end to be a bit predictable, but that didn't make it any less satisfying for me. Instead, it seemed more natural than predictable. While I would still recommend The Midwife of Hope River, I do think that this book--due to the fact that it is more streamlined than its predecessor--might be more appealing for some readers. Whether you read this book on its own or as part of the Hope River series, I think it would be well worth your time. This book is a good account of how people had to live during the Great Depression in West Virginia. I also enjoyed reading about the CCC (Civilian Conservation Corp) which I knew nothing about. An informative historical fiction. Lovers of TV’s Call the Midwife will enjoy this tale of a small-town American midwife’s assistant, reluctantly taking on the job when the Depression leaves her hopeless and almost homeless. The lives of people struggling on the edges of poverty are vividly portrayed, and there’s plenty of well-researched history, covering race relations, rejection of outsiders, mistrust of government programs, and the pursuit of medicine. Protagonist Becky is a doctor’s daughter and physician’s assistant. But th Lovers of TV’s Call the Midwife will enjoy this tale of a small-town American midwife’s assistant, reluctantly taking on the job when the Depression leaves her hopeless and almost homeless. The lives of people struggling on the edges of poverty are vividly portrayed, and there’s plenty of well-researched history, covering race relations, rejection of outsiders, mistrust of government programs, and the pursuit of medicine. Protagonist Becky is a doctor’s daughter and physician’s assistant. But the doctor she worked with has lost his mind, just as the world lost its financial safety-net. Now Becky cares for her employer as if he were a child, and cares for neighbor’s children and children-to-be. Meanwhile the Civilian Conservation Corps sets up camp, and a handsome stranger threatens to steal Becky’s heart. The story is enhanced by quotes from Nurse Becky's diary, lending a powerful sense of immediacy, soon paired with a touch of mystery. Details are convincing. Characters are pleasingly complex. And the dialog mostly rings true to life (though I have issues with some of the swear words which felt awkwardly modern). A recurring theme is the way we make assumptions – who can be trusted, who can be healed, who is worth caring for – and how easily all those assumptions can be wrong. In a world of poverty, trust is paramount. And in a world of broken trust, mercy might rule. A thin thread of faith reminds the characters that there’s something more to be trusted, beyond themselves, but the story works equally for readers of faith and readers just interested in an honest tale set in the world our grandparents knew. Disclosure: I received a free copy in exchange for my honest review. I didn't realize when I picked up this book that it was part of a series, but not to worry you didn't need to read The Midwife Of Hope River. This story takes place during the Great Depression in a small town in West Virginia. I've read a lot of books that take place during this time period, but West Virginia really was hit hard by the depression. As you see how hard the people worked and struggled to get by. It really is hard to imagine how they lived on so very little, and my heart ached for so I didn't realize when I picked up this book that it was part of a series, but not to worry you didn't need to read The Midwife Of Hope River. It really is hard to imagine how they lived on so very little, and my heart ached for so many of them. Nurse Becky isn't quite the woman I expected her to be. She's a compassionate nurse, caring for her former boss because no one else will, including his family. She is a registered nurse, but she doesn't like delivering babies. That kind of struck me as odd, but it definitely allows her to fit the title of the book. The story is told through snippets of patients or events, but not quite like a diary, except when Becky starts midwife duties, and then she sums up the deliveries. More important than those entries are the ones that Dr. Blum makes as he begins his recovery. These books have recommended to people that like the Call The Midwife series, and I definitely can say that is a good rec. It also lets you see how midwifes worked in the US. Most of all, this is a book that will really get your emotions in a twist. You will laugh and cry many times over while reading this book. This was a really well written novel that I read in one day. Excellent book! The ending made me teary. "From devastation comes new life"
* there is an emergency c-section that I had to skip that lasted a couple of pages. Some of the births are too detailed also. I wish that was left out but I'm very much a queasy person when it comes to this stuff. It may not bother anybody else. However, I still loved this book and the gentle wisdom in it. I was captivated by The Reluctant Midwife: A Hope River Novel, which is set in rural West Virginia in the 1930's. I was immediately drawn to the mystery of why surgeon Dr. Blum suddenly became mute and remained so. Why would his nurse of over seven years, Becky Meyers, tote him from place to place, caring for him when they had only a professional relationship? Because of his nearly catatonic state, he had lost his medical practice and both lost their livelihood. I eagerly followed the trail of c I was captivated by The Reluctant Midwife: A Hope River Novel, which is set in rural West Virginia in the 1930's. I was immediately drawn to the mystery of why surgeon Dr. Blum suddenly became mute and remained so. Why would his nurse of over seven years, Becky Meyers, tote him from place to place, caring for him when they had only a professional relationship? Because of his nearly catatonic state, he had lost his medical practice and both lost their livelihood. I eagerly followed the trail of clues while the lives of Nurse Becky, Dr. Blum, and Patience Hester and her husband were woven together. Author Patricia Harmon's voice brought life to the unfolding drama. And I became one of the neighbors of the small rural community who kept tabs on everyone living in within its boundaries. You wouldn't need to have a particular interest in midwifery to be swept up by The Reluctant Midwife. Harman's descriptions of the Depression-era West Virginia countryside—the mountains, rivers and plants—provide a vivid backdrop for this narrative. The 1930's weren't so different from the challenges and hardships we face. The characters live during hard economic times that shake up the lives of folk from all walks of life. Natural disasters and drought have far-reaching impact on the livelihoods of families throughout the nation. There is racial strife. There are sacrifices by those serving in the armed forces. There are social implications for families of wounded warriors returning home with visible and unseen scars. Much of this certainly resonates today. The life of nurse Becky takes a twisted turn along her professional path, and the reader shares her trepidation and responses to the events around her. New government programs, like the Civilian Conservation Corps, are developed to stimulate the economy. Radio broadcasts bring news of Hitler in Germany and the Spanish Civil War. Women and African Americans are afforded less status by mainstream culture and have fewer job opportunities. There is a good deal of medical talk and details of home births. The Reluctant Midwife is rich in underlying themes as well, such as how the Dust Bowl affected agrarian life in America. During the Dust Bowl, farmers headed west to California where they found hope in more fertile valleys. These regions are now are drying up, just as our western states once again experience drought. Like the author, I am a baby boomer and many of my relatives shared stories of the Great Depression and their experiences with war. This novel helped me better understand what it was like for my father growing up in the 30's, as my grandfather was a small town country doctor. The historical context adds an important dimension to The Reluctant Midwife; however it is the craftsmanship of Harman's writing and her unique expression that is compelling. A broad audience will thoroughly enjoy this book. I won't deny that my love of the BBC series Call the Midwife is what sparked my interest in The Reluctant Midwife, but the reality is that, except for the fact that midwifery is central to both stories, there really aren't many similarities. The TV show, while based on memoirs, is quintessentially English, and set in the 50s and (now) 60s. This novel is a decidedly American story, and takes place during the Great Depression. You might think that such a period would lead to a depressing story, but you'd be wrong. While Patricia Harman's characters do experience hardship and loss, the entire novel is imbued with so much hope and humor that at times it was difficult to mute the Annie soundtrack running through my brain while I was reading it. Which is not to imply that it's at all childish, because it's not. What this book is, is a very honest, human story about two couples who share the predisposition to be healers. The first is Becky and Isaac, although they're not really a couple in the romantic sense. The majority of the novel is written in first person, from Becky's perspective, so we come to know her best. There were times when all I wanted to do was tell her to stop being such a prude, and get her hands dirty, but that only means I was invested in her story. The other couple, midwife Patience and her husband the local vet. This novel is actually a sequel to Harman's previous one, The Midwife of Hope River, in which told Patience's story. I haven't read the first book, but I didn't feel like I was missing key information, and I like that. I'm sure my enjoyment would only have been greater if had. While a story set in the 30's could easily be depressing and bleak, this book was neither. Instead, it showed us people who persevere in the face of hardship, and find solace in love and laughter. I liked that the author gave us a sense of place (Appalachia) without locking us into the landscape of a specific existing town, letting us fill in the blanks ourselves, and I really liked the way she gave us hints of the politics of the day, and of events outside the immediate environs of this tale. An oblique reference to the midwestern prairie, for example, reminds us that the Dust Bowl was a concurrent event. Populated by flawed, feeling, incredibly real people, this novel was a thoroughly enjoyable and interesting read. The resolution of Becky's relationship with Isaac was a bit predictable, but in no way reduced the integrity of the rest of the story. Nurse Becky Myers and her former employer, Dr. Isaac Blum, travel back to their origins in a small West Virginia town. They are almost penniless and Blum bears the appearance of a mentally challenged individual who just stares and is totally dependent on Becky to feed, dress and change him on a daily basis. Her own marriage has fallen apart as her husband was obviously suffering from what we now know is PTSD, post-traumatic stress disorder, a violent aftermath of his war experiences. Later he fi Nurse Becky Myers and her former employer, Dr. Isaac Blum, travel back to their origins in a small West Virginia town. They are almost penniless and Blum bears the appearance of a mentally challenged individual who just stares and is totally dependent on Becky to feed, dress and change him on a daily basis. Her own marriage has fallen apart as her husband was obviously suffering from what we now know is PTSD, post-traumatic stress disorder, a violent aftermath of his war experiences. Later he finds comfort elsewhere and Becky is left with nothing. Add to this stark scenario the fact that it is the 1930s and the Great Depression in America is at its height when there are no jobs to be had and no food for daily sustenance. The people in Becky’s world survive by sharing the little they have and the bond that establishes is deeper than even family in many instances. Becky and Blum find a home in an old home abandoned by Becky’s friend Patience, who is now married and a practicing midwife. Becky herself is a nurse but dreads practicing childbirth outside of the accepted venue of a hospital and even then she’s not so fond of that part of nursing. She’s more comfortable assisting Patience as she used to do with Blum. But necessity will draw out her skills and her ability to do what she hated. This is the story of Becky and Blum, who represented a wounded America struggling to survive disaster on a daily basis. She will deliver children, medicate an asthmatic boy in crisis, set fractured bones and more. Every scene is exciting, tension-ridden, and laced with first uncertainty and then care and compassion. Healing is mental and emotional for all involved and even Blum occasionally comes out of his almost catatonic state. The government, in this devastating time, is providing jobs through the CCC or Civilian Conservation Corps. They establish camps to which the destitute draw, a motley lot whom Beverly will eventually nurse out of several disasters, including an horrific fire that almost destroys the camp’s buildings and homes of its employees. The Reluctant Midwife is another Hope River Mystery which immediately engages the reader and is almost impossible to put down. The town gives more than physical shelter to its residents, including some unsavory characters, and is more about opportunities for more than survival and includes some riveting secrets laced throughout the overriding medical plot. Very nicely crafted, Patricia Harman and strongly recommended! This book was so different from what I was expecting it to be. Becky Meyers is a registered nurse and finds herself now caring for the doctor for whom she worked as he is now in a catatonic state of some sort. His family has abandoned him and she refuses to do the same. It is the height of the Great Depression and finding work is almost impossible for a man let alone a woman. Becky pushes through managing through grit, determination and some luck to keep the two of them from starving – but barel This book was so different from what I was expecting it to be. Becky Meyers is a registered nurse and finds herself now caring for the doctor for whom she worked as he is now in a catatonic state of some sort. His family has abandoned him and she refuses to do the same. It is the height of the Great Depression and finding work is almost impossible for a man let alone a woman. Becky pushes through managing through grit, determination and some luck to keep the two of them from starving – but barely. The Reluctant Midwife is the second book in a series and I did not read the first book but I felt no loss for not having done so. It stands alone very cleanly. As Becky establishes herself back in her hometown she assists her friend Patience, a midwife, on calls even though she would rather not have anything to do with childbirth due to a bad experience. But it was Patience that gave Becky and Dr. Blum the helping hand they so very much needed so Becky does not feel that she can deny Patience when asked. Becky finds a semi-regular job using her nursing skills and things seem to be settling in to a good place when a disaster in the form of a forest fire comes along and threatens everything. I really enjoyed reading this novel even though I had put any books in this time period on hold. Something about it intrigued me and I’m so glad I did decide to read it. Becky is a fascinating character; I’m not sure I liked her and at some times I’m sure I really almost hated her but she was in a really horrible place and being a woman at that time without a husband must have been very difficult. Ms. Harman has a way of drawing her reader in to time and place that I really loved as I found myself very glad that I didn’t have to live through the Depression. The characters are all very well developed, distinct and unique and the flavor of West Virginia was very present. An excellent follow-up to The Midwife of Hope River, this book takes place many years later and is told primarily from the perspective of Nurse Becky Myers formerly of Virginia. Becky finds herself nearly broke, unemployed, and the only person willing to take care of her disabled charge. When it's clear they can no longer stay in her small apartment in Virginia, her charge breaks his silence of many months and says one word: "Hope" Putting the pieces together, Becky packs them up and heads for H An excellent follow-up to The Midwife of Hope River, this book takes place many years later and is told primarily from the perspective of Nurse Becky Myers formerly of Virginia. Becky finds herself nearly broke, unemployed, and the only person willing to take care of her disabled charge. When it's clear they can no longer stay in her small apartment in Virginia, her charge breaks his silence of many months and says one word: "Hope" Putting the pieces together, Becky packs them up and heads for Hope River, the former home of Dr. Isaac Blum. The charm of this series definitely comes from the reality of Harman's characters. The inhabitants of Hope River, West Virginia are all struggling during the Great Depression, but they are getting by together. They lean on each other for support, share meals, barter, and do whatever it takes to help each other out. In that regard, this was a refreshing read. I'm sure not every community was this charitable with its neighbors, but I liked to believe that places like Hope River still exist today. It was interesting to catch up with the characters from the first book, too. Of course we have many childbirth scenes, but about midway through the book things change a little as Nurse Becky finds employment as an RN. She meets many new challenges there and makes even more friends. This is the 4th book of Patricia Harman's that I have read - the sequel to this book plus two non-fiction accounts of the author's life were the other three. I'm sorry to write that this is my least favorite of all the books. I loved the sequel to this book "The Midwife of Hope River." One reason I fell so in love with the story were the characters of the midwife, Patience and her assistant midwife Bitsy. Both were bigger-than-life and cared for (both physically and emotionally) the women of Hope This is the 4th book of Patricia Harman's that I have read - the sequel to this book plus two non-fiction accounts of the author's life were the other three. I'm sorry to write that this is my least favorite of all the books. I loved the sequel to this book "The Midwife of Hope River." One reason I fell so in love with the story were the characters of the midwife, Patience and her assistant midwife Bitsy. Both were bigger-than-life and cared for (both physically and emotionally) the women of Hope River and surrounding areas in West Virginia. The protagonist of this story - Nurse Becky Myers - was in the prior book and she was far from my favorite character even then. Self-absorbed to the nth degree, I just didn't care for her or the Doctor Blum she worked for. So now both Becky Myers and Isaac Blum are back as the lead characters in this story. Both start out as self-absorbed, unlovable characters. BUT, without saying too much, there is big change in the book, for both characters. Patience still plays a big part in this story, which I was glad about but Bitsy has moved out of the area. Author Harman really researches her books. This one takes place in the mid-1930s, during the years of the Great Depression, during the Dust Bowl years. There is wonderful, interesting information about the CCC - Civilian Conservation Corp. The author has a real knack for bringing her characters to life on the pages of her stories - the main characters and the secondary ones too. I really felt like I knew so many members of the Hope River community and the CCC camp. Even being my least favorite of Harman's books, it is still well worth reading. There is growth in the characters and some surprising circumstances along the way, some interesting American history and many heartwarming moments. This is the second novel in the Hope River series, and will work equally well as a standalone or as a sequel to The Midwife of Hope River. The story is very readable, told in interconnected atmospheric vignettes. It is well researched and passed my Wikipedia test. I learned new facts as I read, and was inspired to learn even more- about the CCC, tuberculosis, midwifery, the state of medicine in the 1930's, and the Great Depression. The story's main protagonist is Becky, a nurse caring for her fo This is the second novel in the Hope River series, and will work equally well as a standalone or as a sequel to The Midwife of Hope River. The story is very readable, told in interconnected atmospheric vignettes. It is well researched and passed my Wikipedia test. I learned new facts as I read, and was inspired to learn even more- about the CCC, tuberculosis, midwifery, the state of medicine in the 1930's, and the Great Depression. The story's main protagonist is Becky, a nurse caring for her former physician employer, who is in a catatonic state after his wife's death. With the help of friends Patience and Daniel, a midwife and veterinarian, the duo manages to eke out a living as the doctor's state slowly improves. The stories of the townspeople and the workers from the nearby Civilian Conservation Corps camp provide a wonderful glimpse into life in Appalachia during the 1930's. I had not been aware of this author until I had the get good fortune to receive an ARC of this title. I had no expectations as I began to read. I suppose that I was thinking along the lines of the television series "Call The Midwife". What an excellent read this is! We follow this tale , whose protagonist is a registered nurse who is caring for her former employer- a currently disabled doctor who presents, as the story begins, as more or less catatonic. Penniless and destitute, they have enough m I had not been aware of this author until I had the get good fortune to receive an ARC of this title. I had no expectations as I began to read. I suppose that I was thinking along the lines of the television series "Call The Midwife". What an excellent read this is! We follow this tale , whose protagonist is a registered nurse who is caring for her former employer- a currently disabled doctor who presents, as the story begins, as more or less catatonic. Penniless and destitute, they have enough money for gas to travel to the town where the doc had formerly practiced only to find that the Great Depression had followed hard on their heels. This is a story of despair and hope, of family and friendship, and of rebirth in unanticipated ways. I found this to be an uplifting story that was beautifully paced and features well developed characters and a strong plot. It was a book that I did not want to put down and that portrays this sad time with gritty realism and a relentless eye. It was an education in a way that made me grateful for the relative prosperity that we now enjoy and also gave me a better understanding of what people who lived through these difficult times endured. I read both of the Hope River books, and enjoyed them very much. The first book ( The Midwife of Hope River) is about Patience, a midwife in rural West Virginia, who is struggling to survive in tough economic times during the depression. The author, Patricia Harman, describes the desperation so many families faced in the 1930's and the characters in the story are very interesting and believable. Two of the characters, Nurse, Becky Myers, and Dr. Blum in the first novel become the central protago I read both of the Hope River books, and enjoyed them very much. The first book ( The Midwife of Hope River) is about Patience, a midwife in rural West Virginia, who is struggling to survive in tough economic times during the depression. The author, Patricia Harman, describes the desperation so many families faced in the 1930's and the characters in the story are very interesting and believable. Two of the characters, Nurse, Becky Myers, and Dr. Blum in the first novel become the central protagonists in The Reluctant Midwife. The book continues in West Virginia and takes place a few years after the first novel. The CCC work camps and Eleanor Roosevelt are woven into the story line as well as Becky's struggles to support herself and Dr. Blum. We are reunited with the midwife Patience, who is now married with a family of her own. The friendship between Becky and Patience continues to grow amid the challenges of the tough economic times everyone was experiencing in the 1930's. It was during this time that Patsy attended her first home birth, more or less by accident. "Some people are destined," she has written. "I was staying at a woman friend's commune when she went into labor and I ended up delivering my first baby." Soon after, Harman traveled to Austin, Texas to train with a collective of home-birth midwives. When she returned, she became one of the founding members of The West Virginia Cooperative of Midwives. Her passion for caring for women and babies led her to become an RN as the first step in getting licensed as certified nurse midwife. In 1985, with her children, a yowling cat and her husband she traveled north, pulling a broken down trailer to begin her training at the University of Minnesota where she received her MSN in Nurse-Midwifery. For the past twenty years, Ms. Harman has been a nurse-midwife on the faculty of The Ohio State University, Case Western Reserve University and most recently West Virginia University. In 1998 she went into private practice with her husband, Tom, an OB/Gyn, in Morgantown, West Virginia. Here they devoted their lives to caring for women and bringing babies into the world in a gentle way. When, in 2003, the cost of liability insurance for Obstetrics sky-rocketed from $70,000 a year to $110,000, the Harman's decided to give up deliveries. Though many loyal patients grieved the loss of their favorite mid-wife/physician team, the change in life style gave the author time to begin writing her first book, The Blue Cotton Gown: A Midwife's Memoir. Patricia Harman still lives and works with her husband, Ob/Gyn Thomas Harman, in Morgantown, West Virginia at their clinic, Partners in Women's Health Care. Though she no longer attends births, she provides care for women in early pregnancy and through-out the life span. She brings to this work the same dedication and compassion she brought to obstetrics."